Gorgeous grunge was whipped out again to add a bit extra to this card. Stamped images of feathers in Blackberry bliss were spritzed with a bit of water while wet to create the blurred background. 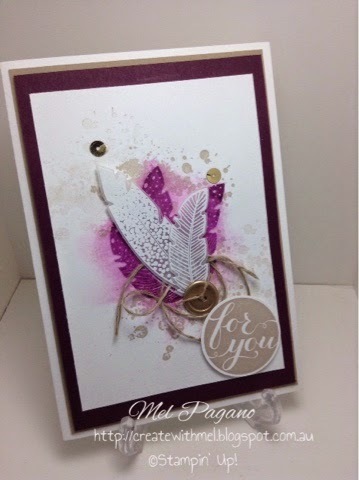 I then stamped on to vellum and used white embossing powder for the feathers. Blîng it all up with a gold button, some sequins and my all time favourite linen thread and you’re done! Simple and effective and can be used as a masculine as well as a feminine card….now to try it in grey and black tones! And today is the last day of Saleabration – if you still have a wishlist, you still have time to click on my shop online button and place your order…Once they are gone, they’re gone for good! We had some very popular items from Saleabration that are already sold out! I would love to hear what your favourite product was this year! « Love No Limits with Butterfly Basics!